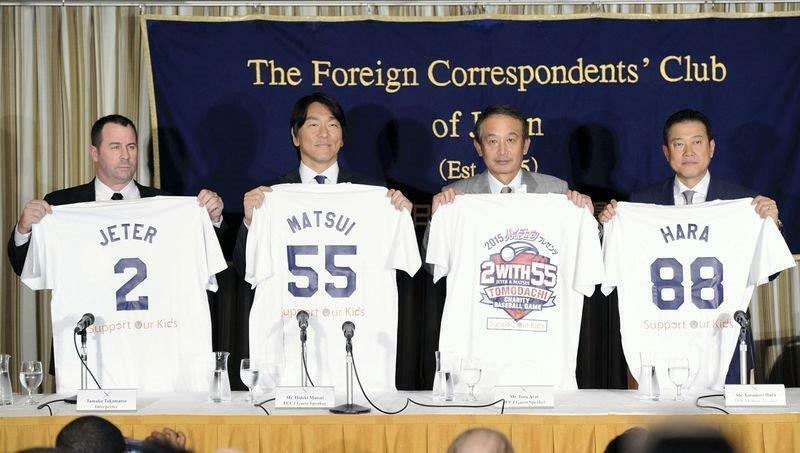 (The Yomiuri Shimbun December 18, 2014) Hideki Matsui will hold a charity event at Tokyo Dome in March for children in the disaster-hit Tohoku region, the Yomiuri Giants legend has announced. The event will be held on March 21 as part of Support Our Kids, a project for children in the region hit by the March 2011 earthquake and tsunami. The project is supported by foreign embassies in Japan. During a press conference Wednesday at the Foreign Correspondents’ Club of Japan in Yurakucho, Tokyo, the retired slugger said the event will also feature Derek Jeter, one of Matsui’s teammates during his days with the New York Yankees from 2003 to 2009. Giants manager Tatsunori Hara also attended the press conference as he will take part in the event. The event will include a baseball lesson for primary school students, in addition to a game between middle school students from Tohoku and their American counterparts living in Japan. Matsui and Jeter also plan to compete against each other in how many homers they can hit. Meanwhile, Giants infielder Shuichi Murata presented the Kanagawa Children’s Medical Center on Wednesday with about ¥2 million to support medical services for newborn babies.